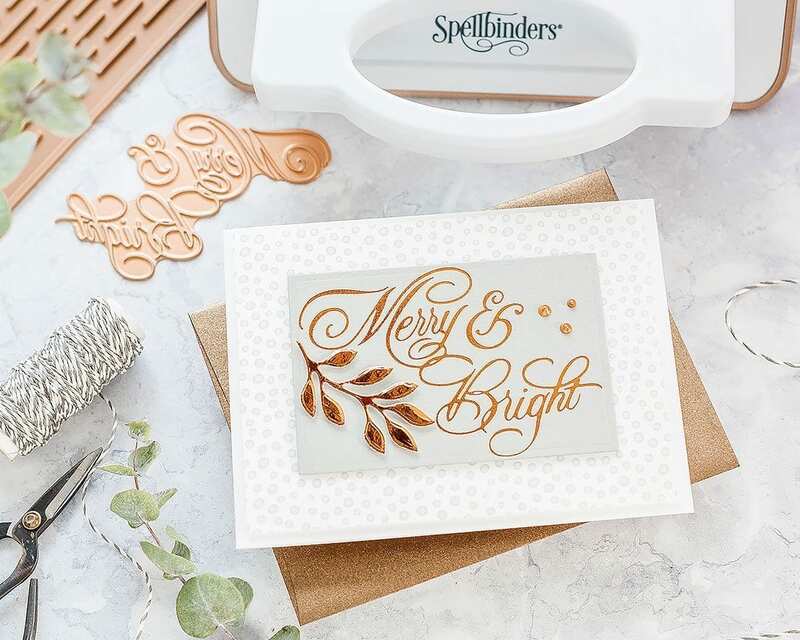 Today I’m unboxing and taking a first look at the Spellbinders Glimmer Hot Foil System. As much as I love foil on cards, I’ve not previously gone down the foil route. The Spellbinders system tempted me though, and that’s because of the letterpress look you get as well as the foil with this system. I’ve been a long-term fan of letterpress, and the combination of letterpress and foil was enough for me to give this system a go. So my caveat to today’s post is that as this is my first time foiling, then I have little to reference this machine against. However, I hope you still find my thoughts and experiments helpful. I’ve linked all supplies at the end of this post. Compensated affiliate links used. Watch below or in HD on YouTube. This is a true unboxing as I turned the camera on so I could walk you through exactly what is included in this Spellbinders Glimmer Hot Foil System. 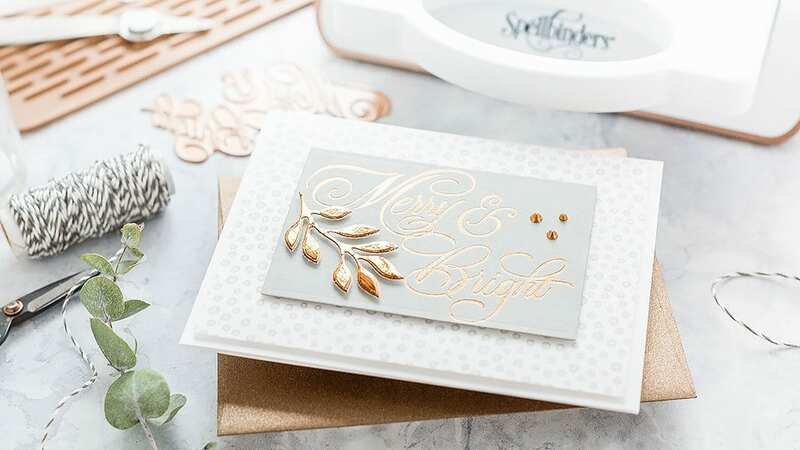 I have a Spellbinders Platinum 6 die cutting machine, and I love the clean lines of the white and grey colour scheme, and I’m delighted to see the Glimmer machine is the same. As indicated on the box along with other information on how to use the machine and what materials can be foiled is the fact that you do need a die cutting machine in addition to the Glimmer machine. I placed a Glimmer plate on the heated platform; there’s a wide range available for all occasions. Instead of straightening the plate on the platform with my hands, I used the magnetic tweezers. The great thing about these tweezers is that the magnet sits on only one of the prongs. So if you want to pick up the plate then you can do so with the magnet but if you just want to shuffle it around so that it is straight then you use the other prong, and that allows for small adjustments. I’ll be using these tweezers a lot not just for use with the Glimmer machine. I guesstimated how much foil I needed and cut the piece. Spoiler alert here, I love the foiling I get with this system, but the most difficult aspect I found was cutting the foil as it is whisper light and doesn’t provide much resistance for scissors to cut through. However, my Tim Holtz scissors came to the rescue, these scissors are so good and coped with the delicate foil. I placed the piece of foil pretty side down over the plate and added a piece of Smoke card. I then added the spacer and shim on top and pressed the timer button. The green timer light flashes and once the time is up the light turns to a continuous green, and it’s ready to run through the die cutter. Gently pull the platform from the base and run through the die cutter. 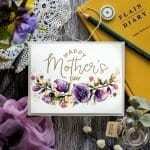 I have a Spellbinders platinum 6 die cutting machine, but the Glimmer Hot Foil System works with a range of die cutters. I ran the sandwich through the machine and back a couple of times, not for any particular reason, it’s how I die cut too. I guess I feel a couple of runs through will give the chance of a better result than one run through. I lifted the shims away and picked up the card from the platform with the tweezers and peeled back the foil to reveal a beautifully foiled and letterpressed sentiment. I used the tweezers to place the glimmer plate on the silicone mat to cool and clicked the platform back in to place ready for next time. I did get some excess foil sticking around the edges, but that is easy to remove with a sand eraser. I know in hindsight that I’d cut too big a piece of foil. I got the best results with minimal extra foiling when the foil was cut just a tad larger than the plate. However, a sand eraser did a fabulous job and removed the excess foil without damaging the surface of the card. To some extent, the extra foil didn’t matter anyway as I die cut the piece with an A2 Matting Basics A die. The Glimmer machine can not only foil glimmer plates, but also wafer dies as well. I decided to use a wafer die with the foil but in a different way though. I took a piece of Scrapbook Adhesives adhesive sheet and added it to Marshmallow card. I then removed the protective backer and laid on the sticky surface a piece of leftover foil. I then die cut a sprig from the Little Plants die set. The die cut catches the light and is so pretty and shiny in real life. I don’t think the camera or the video really captures how pretty this foil is. I had this patterned paper in mind as it matched the Smoke card perfectly. This paper is one from Alexandra Renke, and I love the modern pattern as well as the thick quality of this paper. I cut a piece of the patterned paper to 5 1/4 by 4 inches, added foam adhesive to the back and mounted it on an A2 card base cut from Bazzill Marshmallow card. The soft white of this card matched the patterned paper really well. I also added foam adhesive to the back of the grey sentiment panel and added that to the card front and used a T square ruler to ensure I had it on straight. I added small pieces of foam adhesive to the back of the sprig die cut and nestled it next to the foiled sentiment. I felt the top right of the grey panel was now looking a little bare, and so I pulled out Copper Penny Nuvo Crystal Drops and added a trio of droplets to balance things out. Finally, I paired the finished card with a Metallic Copper envelope. And there you have it, my first ever foiled card and the bonus letterpress effect too! 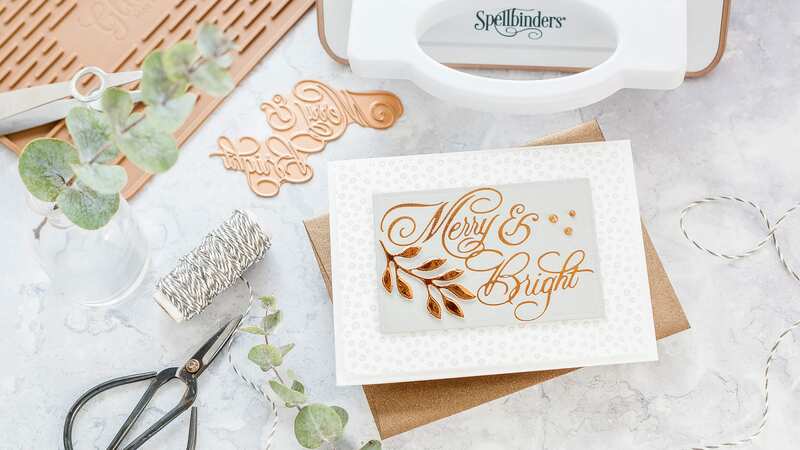 I thoroughly enjoyed experimenting with the Spellbinders Glimmer Hot Foil System, and I think it would make a great Christmas present. Can you use any foil with this machine? Or only the Spellbinders foil? I’ve got a huge supply of Deco Foil and Gina K foil that I would love to use with it! Hi Denise. 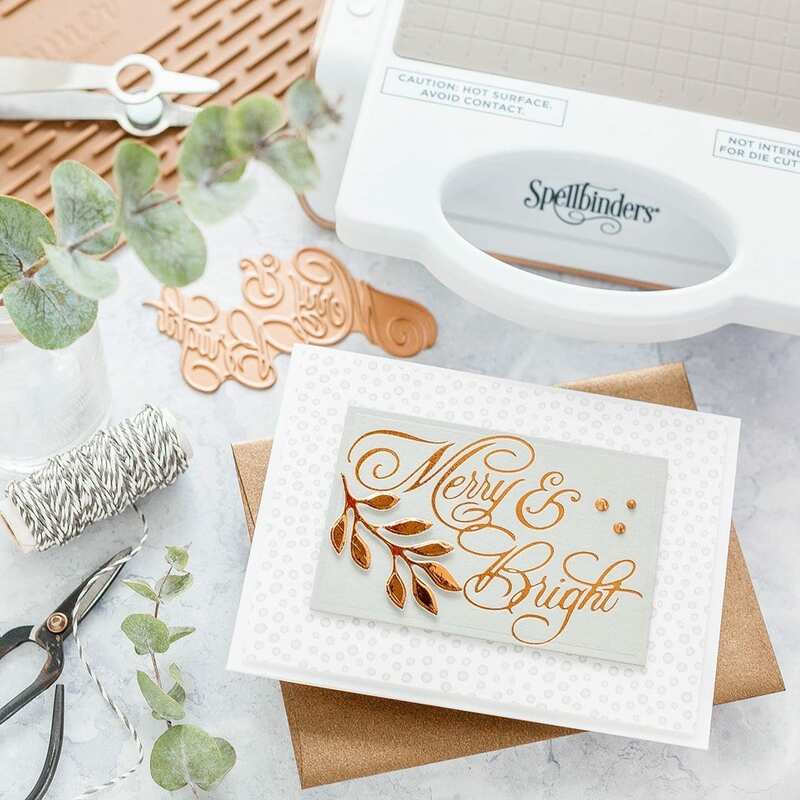 I’ve been following Yana Smakula’s posts about this foiling system as well as this fabulous post by Debby. Yana has indicated that the other Deco and Gina K foils will not work with the Spellbinders system as they are a different type of foil. You may want to wander over to Yana’s blog to see her videos as well. Good Luck! Gorgeous Debby, I love the awesome foiled letterpressing but I still wonder how much people would use this machine after they have purchased it. Thank you for showing.